We love a dress that makes a wow first impression and this off-shoulder taffeta wedding dress has more than just one awe-inspiring detail. From the pleated off-shoulder cleavage to the hand-painted floral design and the gorgeous 2m long train, Jardin is the kind of summer wedding dress that will steal the spotlight. Let your personality free and express yourself and all the things you adore on the most important “canvas” you will ever wear: your wedding dress. Our in-house designer created this beautiful floral pattern to celebrate the beauty of a summer garden in bloom. Flowers are lush and in bloom, colors are diverse are charming, but none will outstage the central jewel: yes, that’s you! This ivory hand-painted wedding dress is an invitation to throw out boring and bring on the fun! 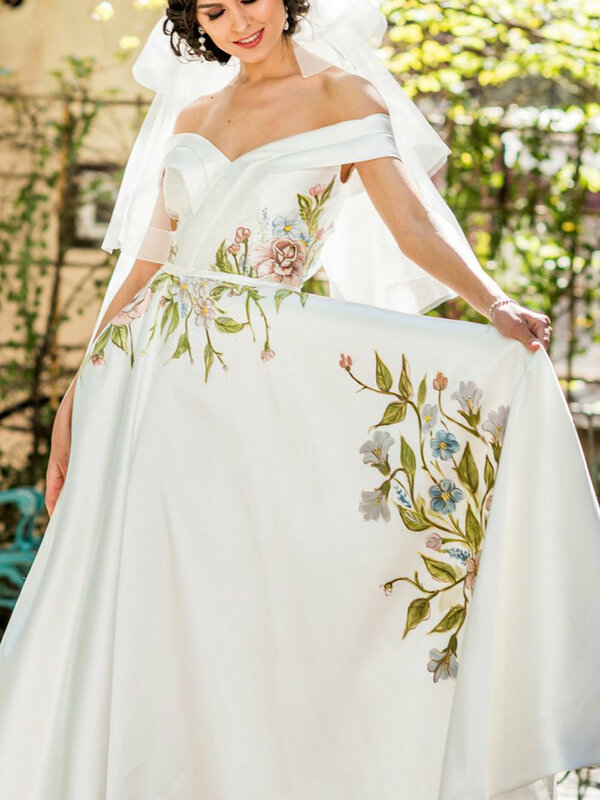 Brides can even send out their desired pattern or theme, and our in-house designer will use it to create a custom hand-painting. Like all the dresses in our 2018 bridal collection Rêve de Fleur, Jardin is a style that aims to bring into spotlight ultimate elegance as it successfully combines luxurious handcrafted details, with innovative design (that makes the dress feel super light) and sophisticated cuts. The off-shoulder cleavage talks of romance, delicacy, and femininity, adding a high dose of ravishing charm, whereas the taffeta, the royal 2m train and the ball gown silhouette will empower any bride and make her feel like a princess. 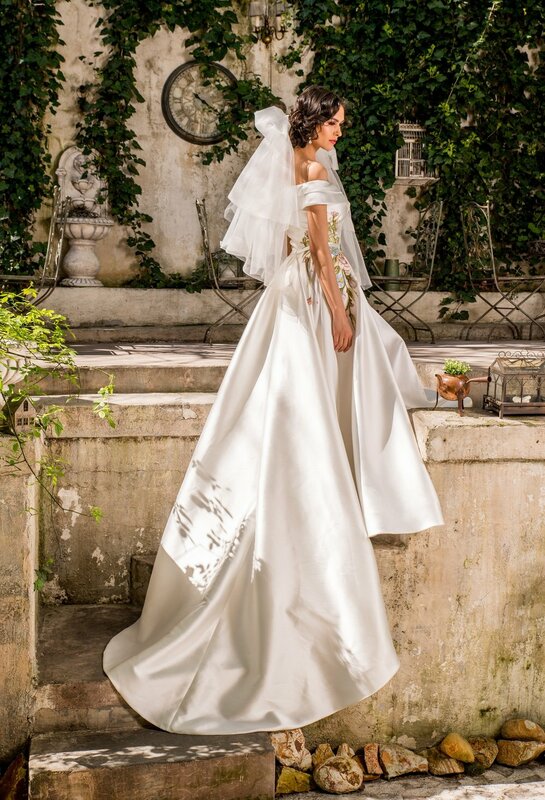 In essence, this wedding dress aims to draw attention to a bride’s unique beauty, celebrate her personal style and allow her to express her romantic self. Not to mention, it’s a very inspired choice for a spring or summer wedding. This beautiful bridal dress can be customized to match your dreams. 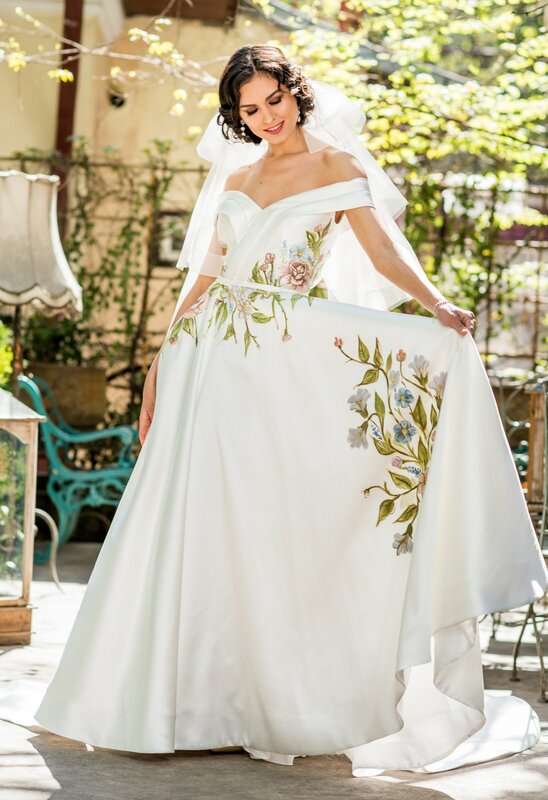 Since this is a hand painted wedding dress we can use your own theme or actual design as inspiration and our in-house designer will do the rest. This way you can wear a really unique gown. Let your imagination flow, we will handle the rest. Jardin features a 2m train and a pleated off-shoulder cleavage. Book an appointment to see if Jardin is the ONE! Jardin is a luxurious wedding dress that was designed for the modern, utterly romantic bride. She dreams of fairytale love, she lights up the room with one smile and she adores to wear unique styles. If this sounds like you, we can’t wait to meet you.